UML modeling on Mac has become increasingly popular in recent years. Unfortunately, there is a lack of Mac UML tools in the market. While many web UML tools claimed themselves to be Mac ready, they lack professional modeling features that can satisfy real UML modeling needs such as model transformation, traceability, management and reusability. 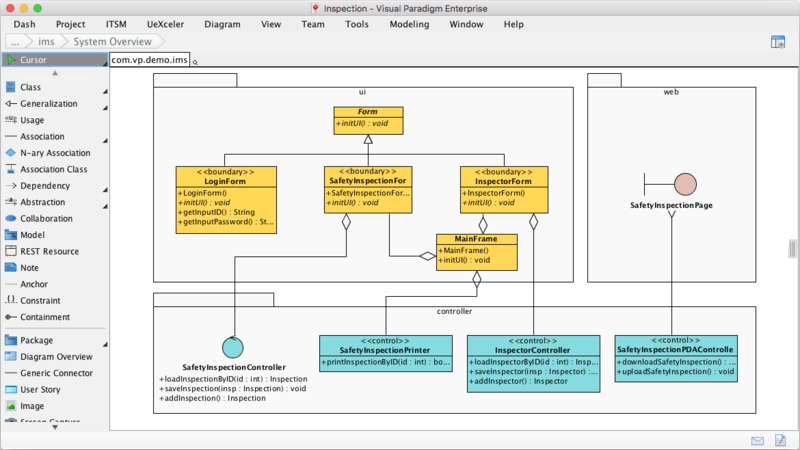 Instead of offering a simple UML drawing tool, Visual Paradigm offers a real UML modeling software and, best of all, it is Mac ready. 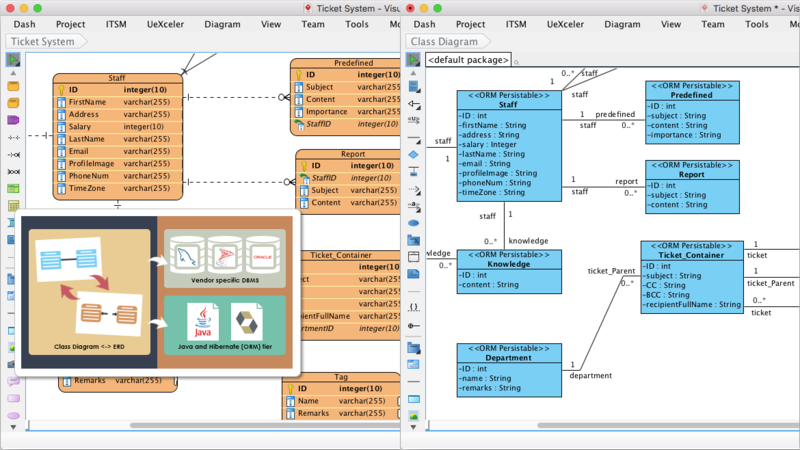 A professional Mac UML tool that supports latest UML 2.x diagrams and notations. Connect UML drawing to BPMN, ERD, DFD, ArchiMate, MindMap, etc. Identify requirements from UML use cases. Keep them as User Activities in user story map and break them down into User Tasks, Epics and User Stories. Describe use case's steps as flow of events. Instant generation of UML sequence diagram from use case through the flow of events. 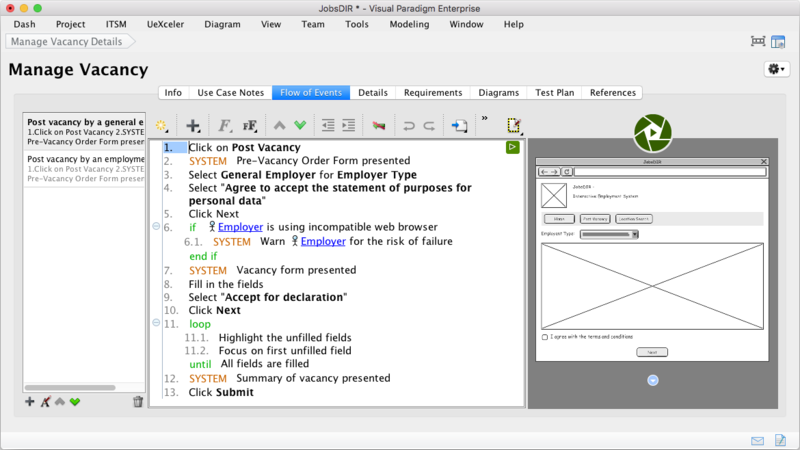 The Mac UML tool also features UX design tools like wireframe tool and storyboard tool. You can integrate wireframes into the flow of events of use case. The Class Diagram tool synchronize your class model with database design (the ERD). It also generates the Hibernate ORM mapping tier required in application development. Model elements (e.g. classes) drawn in one diagram cannot be reused in neither the same diagram nor another diagram as an auxiliary view. Not to mention about the reusability among projects, which makes very difficult, if not impossible, to keep projects' data consistent. Diagrams are all separated and without traceability. There is no effective way to model as-is and to-be relationship between diagrams, and the evolvement from conceptual to logical and physical design in terms of database design. Most of them are no more than UML tools and without strong modeling tools support to unleash the full power of UML. Essential software development activities such as team collaboration, agile product backlog management, UX modeling, code engineering, project management, enterprise architecture are not support. 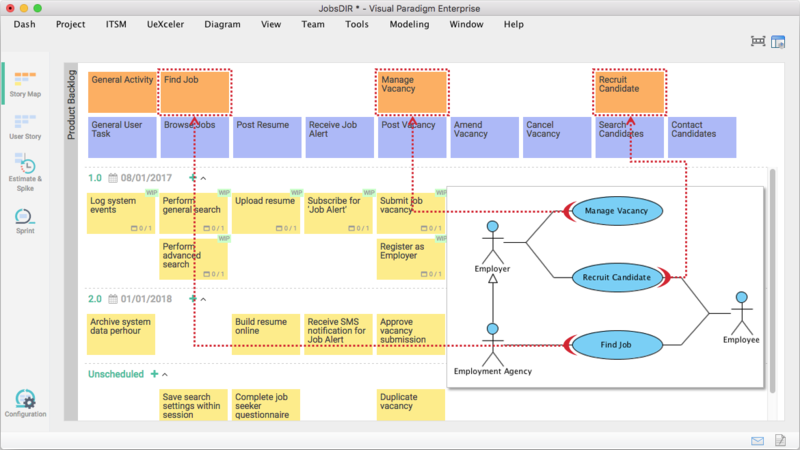 Perhaps, diagramming tools like Visio is suitable in simple UML modeling, they lacks powerful editing support when it comes to modeling complex diagrams. It takes much time to layout diagrams in pleasant manner. In the end, you will only get a set of simple, independent diagrams that are far from adequet in modeling enterprise scale projects. Scalability of work is also a concern. 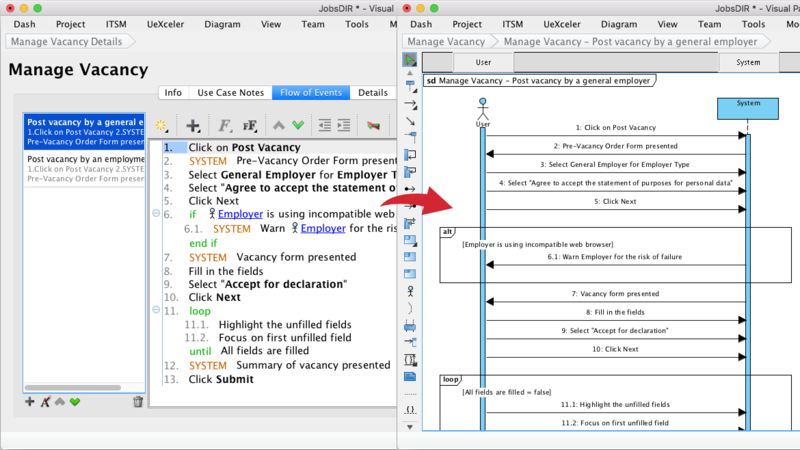 While many Mac UML diagramming tools provide very limited support in UML notations (and even out-of-date), Visual Paradigm supports the latest UML 2.x standard. You can draw latest UML diagrams on Mac! A rich set of award-winning editing features make visual modeling fast and enjoyable - inline editing, Resource Catalog for quick shape creation, Magnet and Sweeper for moving group of shapes at a time, quick layout, Handi-Selection, etc. We simply know what Mac users need! 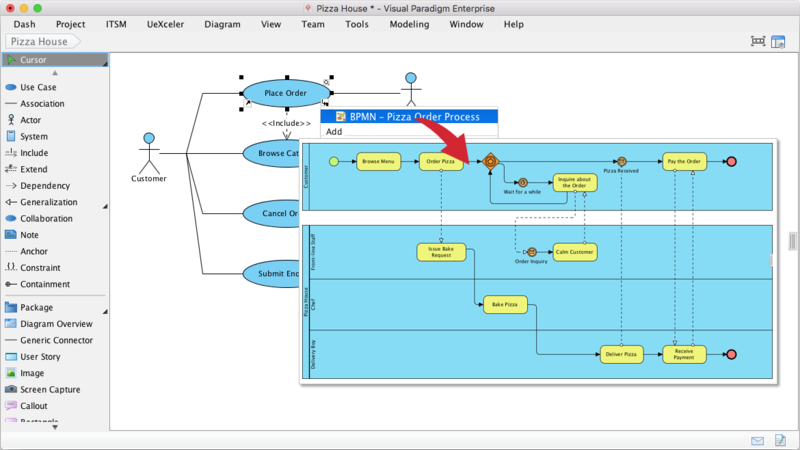 Visual Paradigm provide not only UML design tools but also allows you to access a wide range of diagram tools on Mac, such as ERD, DFD, Business Process Diagram (BPMN), ArchiMate, SysML, SoaML, CMMN, Mind Mapping, Fishbone, Radar Chart, PERT Cart, Textual Analysis, and many more! Model high level system requirements with UML Use Case Diagram. Take advantage of the seamless scrum integration by sending use cases to build-in story map as User Activities for backlog management and relaese planning. 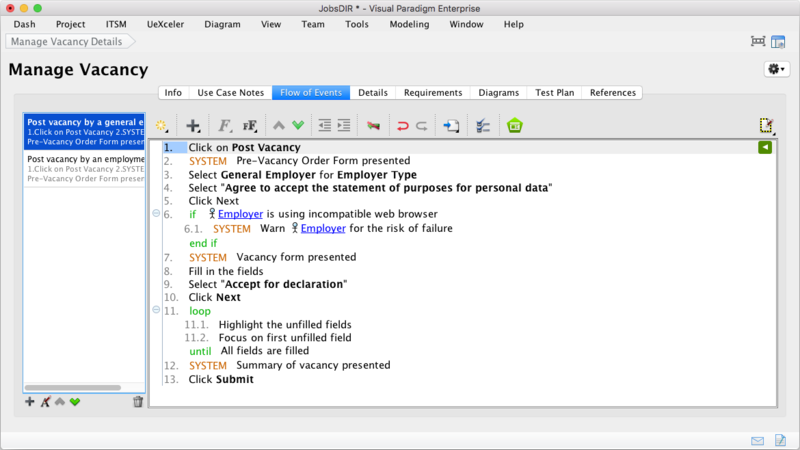 You can send not only use cases but any other visual models (e.g. UML action) to story map! Breakdown User Activities in story map into User Tasks, Epics, and subsequently User Stories! Manage User Stories in the form of task using our build-in Task Management platform. Again, all Mac ready! Generate code from UML Class and State Machine Diagrams. Popular programming languages are supported. Inter-synchronization between UML Class and ERD. Generate database from ERDs and the mapping tier for programming using Hibernate framework. Support of model tradability through various means such as model & diagram references, model elaboration with sub-diagrams, shared view, project referencing for reusing model elements across projects, etc. Integrate the build-in Mac wireframe tools with UML Use Case scenarios for UX design. Maintain traceability among diagrams - As-is to To-be model, evolvement from Conceptual to Logical to Physical database design. Let the whole software team work concurrently and collaboratively with our strong cloud based repository. A real team collaboration solution that supports version control and conflict resolution. Team, in agile, doesn't mean only your development team. We care your clients by providing online diagram publishing and commenting tools. Communicate with stakeholders online over the cloud through the PostMania. Build reports by dragging model elements or diagrams onto a document. Output your document to formats such as PDF, HTML or MS Word. Integrate and incorporate model details into your existing documents.